Basing Electrical Ltd - Electrician based in Old Basing, Hampshire. 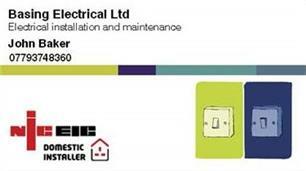 Basing Electrical Ltd was established in 2007. I’m John and I have over 40 years’ experience in the electrical trade. I specialise in all aspects of electric work, but in particular lighting and fault finding. I have retained a large customer base that are happy to use me time and time again because I understand the importance of good customer service and the attention to providing solutions to problems without any drama's. Please call me more information and advice, I am always happy to help.